I wish I could say that I made the jacket with the Singer machine, but the jacket was actually finished last month and I only got the machine a few days ago. 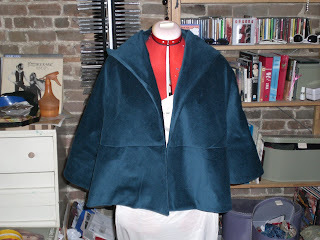 The jacket is Simplicity 4047, made in aquamarine velvet, with a taupe lining. I made it to go with a gold-coloured lace wiggle dress I bought awhile ago. 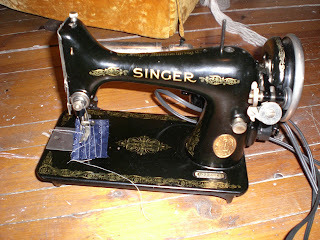 The Singer was a birthday present from my roommate. It’s serial number dates it back to 1930, and it still works! She also got me a couple boxes of attachments, but they haven’t arrived yet. I’m really hoping they will include the ‘Ruffler’ foot. I’m thinking that I’ll test out the machine on the shirt from the same pattern set. Which Challenge Was This Again? 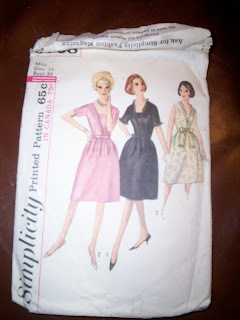 This may have been the Novemeber Challenge extended to January, I’m not sure..
Make something from a ‘current retro pattern’ so – behold Simplicity Pattern No. 4044, 1940’s suit. 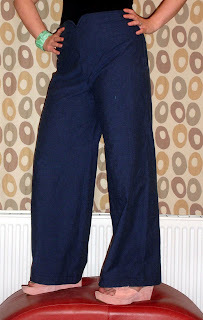 I’ve only managed to run up a pair of pants so far, and they are incredibly comfy! 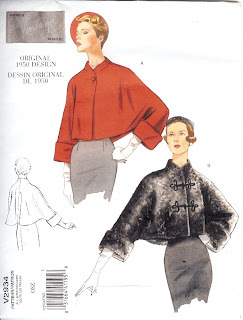 This is from a current Vintage Vogue pattern (2934) for a 1950’s jacket. The jacket is actually quite simple to make, however it is a bit time consuming as the lining is entirely hand sewn. The fabric flower was made from scraps of vintage kimono and a wool blend felt. 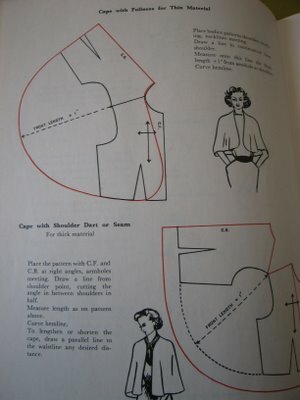 The instructions from Threads magazine #128. It was a fun project to work on. This one is black wool with a lilac satin lining. 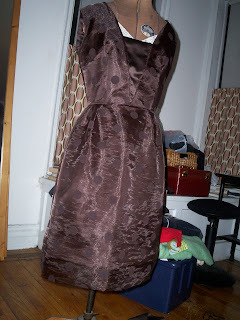 I plan on looking for a beautiful piece of velvet or silk to make another one to have one hand for “special” occasions. I posted this days ago but for some reason the images were not showing. Made using this pattern, stretch linen and vintage buttons. This is a dress I made for the office christmas party. 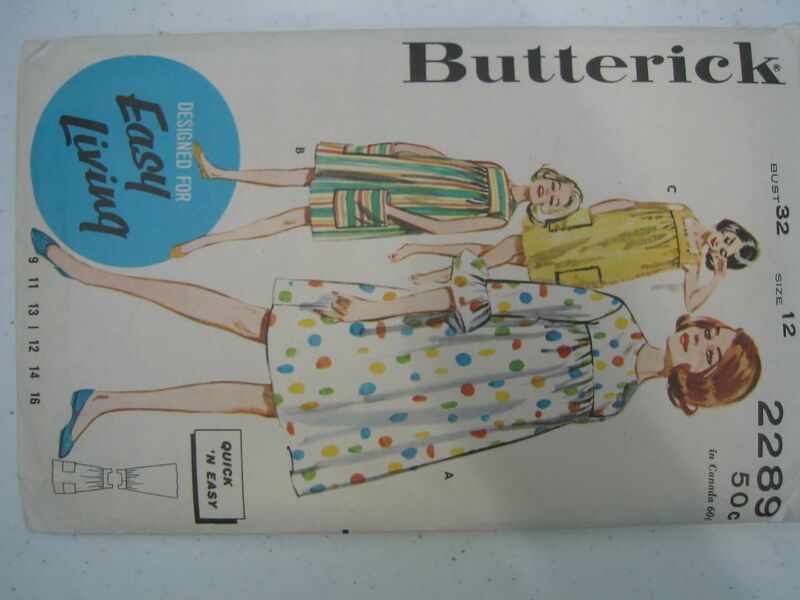 Its a sheer, shimmery material with flocked brown polka dots over a brown duchess satin (the white at the neck is just the slip my dummy is wearing) and from a vintage simplicity pattern. The last 3 inches of hem are just the sheer material, which is why they look a little different in the picture. It was actually a pretty simple pattern. I’m working on a version with sleeves for day. 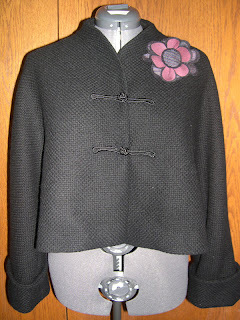 Its black wool gabardine with a houndstooth inset in the front. 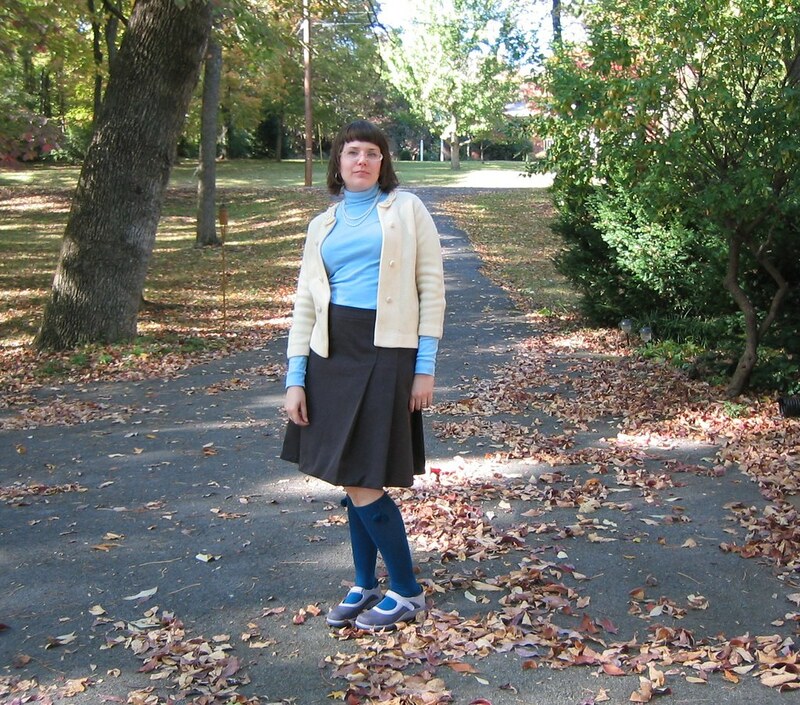 I don’t know what to do about the skirt, though: I don’t think the gab will hold the shape of this skirt well. 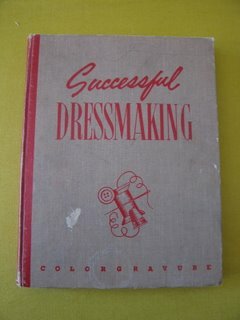 So I can do an ad hoc dirndl, ad hoc pleats, or – ? Skirt suggestions welcome, and I’ll post the new version when its done. It’s my new favorite skirt, I’ve been wearing it several times a week! 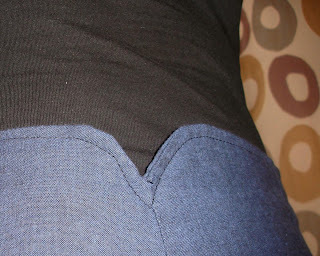 I’m really happy with the way it turned out (ignore the hem in the photo – I’ve fixed the lumpy parts now.) I took my time and made sure to undo any crappy stitching, and only had to put the zipper in twice!